That's about it from the women's series for now - the next game is at the same venue in Guwahati on Thursday, with play starting at 05:30 GMT. You can take a look at Stephan Shemilt's match report from today's game - and as I mentioned, you can listen to the whole game again on BBC Radio 5 live sports extra shortly, from 09:00 GMT. (Click the "play" button at the top of this very page to listen). Until then, make sure you join (a) Tuffers and Vaughan tonight, (b) the men's T20 live text tomorrow, and (c) us again for the next women's game on Thursday. Farewell for now. And if you've not had the chance to listen yet, I can heartily recommend the special TMS programme which marks the 10th anniversary of when the Sri Lanka team bus was attacked by gunmen in Pakistan while they were on the way to a match. Trevor Bayliss and Paul Farbrace, who were Sri Lanka's coaching team then (and are now in charge of England's men's team), have spoken very movingly about that day. You can read all about it here and listen to the TMS podcast. There's more cricket coming up on the BBC to tell you about - from 21:00 GMT tonight on BBC Radio 5 live, the Tuffers and Vaughan Cricket Show will be in session to discuss all cricketing matters. And tomorrow evening, attention switches to the England men's tour of West Indies - we'll have live text commentary on the first of their T20 international series, which begins at 20:00 GMT in St Lucia. Melissa Cole: Good, if expected, win over India by an increasingly depleted @ECB_cricket women’s team as ever, excellent commentary by @bbctms and I thought @SnehalPradhan was concise and insightful. Glad you enjoyed it, Melissa. If you're just checking in and cursing the fact you've missed the game... fear not. You can listen to a full replay from 09:00 GMT on BBC Radio 5 live sports extra. It's also worth reflecting on England's best batting display of the tour. Danni Wyatt (35) and particularly Tammy Beaumont (62 from 57 balls) showed some of the form which helped England break a few records last summer, and march to the final of the World T20 in the autumn. But arguably the innings of the day was compiled by captain Heather Knight, who came in at 95-2 with just under seven overs left, and smashed 40 from 20 balls. Her knock included six successive fours at one stage (including five from one Arundhati Reddy over). So, a straightforward win for England, all told - but if you didn't hear earlier, their injury list has lengthened with the news that all-rounder Georgia Elwiss will be flying home with a stress fracture of the lower back. With Sophie Ecclestone already flown home with a broken hand, and Laura Marsh still on the sidelines with a side strain, England also lost Amy Jones to illness before this game, so they may need a roll-call tonight to see who's still standing. And might we see a replacement player sent out to join the tour? Ex-Middlesex captain Isabelle Westbury on TMS: “Clinical efficiency from England, with a depleted line-up. But it's good to see a good turn-out from the crowd, there must have been 5,000 here. But we saw in the World T20 that when India hit the right notes, they can be a spectacular side to watch. "It sounded after that last ODI that England were finally in the groove. Maybe if the tour was the other way round [with the T20s first], England would be going into the ODIs with the momentum." Ex-India seamer Snehal Pradhan on TMS: “I think this is going to be a good series for England as they have more bases covered. Perhaps some of the India all-rounders bat too low, but the pace bowlers were too expensive today." CricketHer: England batted really well, especially Heather Knight who can turn her game on a sixpence when the situation requires. Not so convinced about the bowling - too many loose deliveries. But can’t complain about the end result. Ex-Middlesex captain Isabelle Westbury on TMS: “Smriti Mandhana showed her naivety and inexperience as a captain which was rather exposed - she set a lot of retrospective fields, although she wasn't helped a lot by Mithali Raj's attitude in the field." Ex-India seamer Snehal Pradhan on TMS: “India have some serious batting concerns. Not the best start under a new captain and new coach, they've got to work out how to deal with the absence of Harmanpreet Kaur. With the crowd filing out, England wrap up a 41-run victory without having to get out of third gear. Pandey uses Brunt's pace to carve back-to-back fours past the two fielders in the point region. Pandey, with 22 from 20 balls, may earn promotion up the batting order in the remaining games. Ex-India seamer Snehal Pradhan on TMS: “That's 18 wides in the innings. Imagine where India would be without those 22 extras." Katherine Brunt will bowl the last over - a wide helps to delay the inevitable. Both sides rather going through the motions - can Linsey Smith find a third wicket? With nine balls of the innings left and 56 needed, India officially need snookers. Careful but pedestrian batting means Smith finishes with 2-22 (the late Richie Benaud would approve). 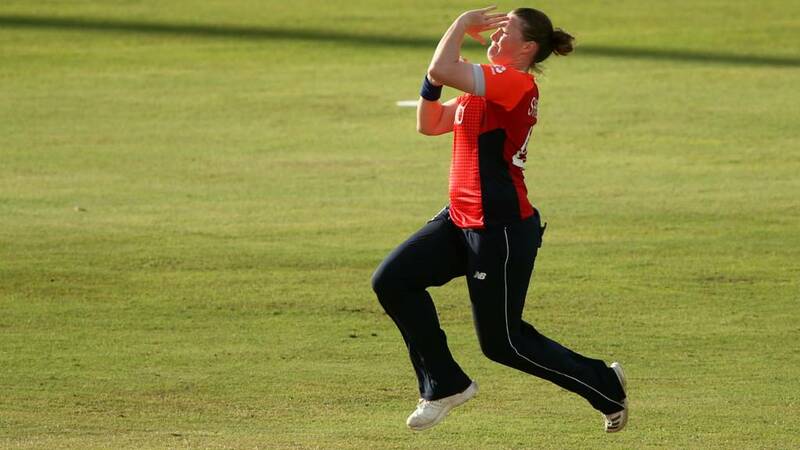 Kate Cross will be the first England bowler to complete her spell... Pandey gets the ramp shot out of her locker, Alex Hartley tries to cut if off at third man but can't do so without her foot being over the rope. A rather messy over, with ones, twos and a missed run-out chance off the last ball means Cross takes her cap with figures of 4-0-23-1. Ex-India seamer Snehal Pradhan on TMS: “Linsey Smith doesn't spin the ball much, Kirstie Gordon didn't spin the ball much but was very effective in the World T20. Is this a secret plan from England to produce spinners?"